Tbilisi, the capital city of Georgia, had not witnessed mobilization on this scale since 2012. In May-June 2018, thousands of people joined together on the streets to support Zaza Saralidze, father of a 14-year-old boy who had been murdered in a street fight. Despite the fact that numerous witnesses were at the crime scene, the investigation was “not able” to identify the murderer. Mr. Saralidze accused high-ranking officials and several priests of covering up the crime to protect the alleged murderers—one, the son of a high-ranking law enforcement officer, the other, the son of an Orthodox priest. For nearly two weeks, political party supporters, crime victims’ families, environmental activists, women’s rights activists, gay rights activists, and civil rights defenders joined efforts in unprecedented gatherings that established a new baseline for civic activism in Georgia. However, the recent mobilization, albeit nonviolent and widespread, lacks many characteristics of successful movements. It lacks clear vision and strategy and does not have an organizational backbone. But it has something that no other Georgian movements have had for a long time—grassroots support. Rose Revolution, November 20, 2003. Credit: Gvantsa Liparteliani, with permission. Georgia has a history of civic mobilization and civil resistance. 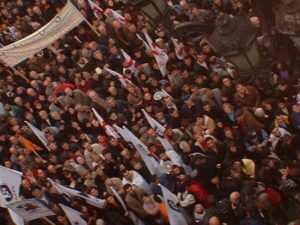 Various efforts of a newly born civil society culminated in the 1990s and led to what is now known as the “Rose Revolution” in 2003. A youth movement known as Kmara ("Enough") composed of students, political party activists, and NGOs coordinated a series of nonviolent campaigns and a month-long boycott of rigged election results. This resulted in major political transformation across Georgia and was famously dubbed the "Rose Revolution" by a Georgian journalist. Under immense grassroots pressure, President Shevardnadze resigned the same year. However, during the period following 2003, participation in civil resistance declined. Economic difficulties, war with Russia, and a generally weak political opposition all played a role in this trend. The weakened civic mobilization enabled the government to design reforms behind closed doors, engage in human rights violations against its own citizens, and slip further away from rule of law. Civil society became dominated by largely donor-driven NGOs that worked on far-off policy issues, or opposition parties with little chance for political success. Grassroots movements slowly faded away. The 2012 election could have changed things. During the election campaign, new civic groups emerged and advocated for progressive change. However, these groups did not coordinate with one another and were geographically spread out. Many suffered from tunnel vision about their specific issues—ecology, women’s rights, minority rights, poverty, labor rights—and were unable to unite under a common vision for Georgian society. As a result, activist groups became intensely sectoral and closed off from one another. Some groups’ approaches explicitly rejected the broader public as potential allies and sources of support, instead of engaging in actions that would create bridges with their fellow citizens. 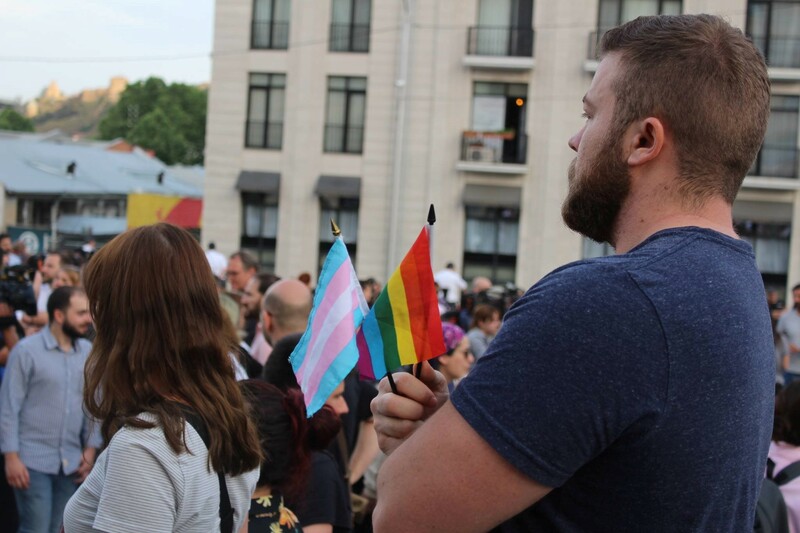 One recent example of discord in Georgian activism took place during the May 17, 2018 protest against homophobia, transphobia, and biphobia. Some LGBT activists boycotted the gathering and even organized a separate event because they felt things had not been planned with sufficient consultation. May 17, 2018, in front of the State Chancellery building. Credit: Tamar Kakabadze, with permission. At the same time, important civil society organizations suffered from donor dependency. The political bias of certain donor organization chairmen came to the fore, giving pause to civil society groups that otherwise would not have hesitated to support those organizations’ grassroots activities. One example was the “Facebook Battle” between grassroots activists and Europe Foundation Georgia chairman David Lawrence Lee (also CEO of the European Business Association in Georgia and business partner of Georgian President Shevardnadze’s son-in-law). In a June 2018 post on his Facebook page, Lee expressed support for the Minister of Justice, whom activists had accused of covering up Saralidze’s murder case, mentioned above. Lee countered these accusations, claiming that the activists had been paid to stoke outrage on social media. He later removed his posts, but the incident showed that civil society actors can present a conflict of interest with grassroots activism. In my work, I often encounter activists who lack experience in coordinating nonviolent campaigns, much less strategic planning to build a society-wide movement. Too often, activism stops at social media engagement. Organizers of recent events are focused on coming up with “new ways” of doing things, instead of drawing on past successes and lessons learned. We may not see masses of people filling the streets like they were during the Rose Revolution. But through my work with grassroots groups, I do sense that many people in Georgia share a strong desire to triumph over police and elite corruption—and many other issues that undermine our livelihoods. We are not yet on the verge of a new Rose Revolution, but with greater capacity for strategic planning and improved bridge-building between civic groups, our generation may have a good chance to once again change the course of history for the better. Featured image: Protest gathering in front of the House of Justice, June 8, 2018. Credit: Mari Nikuradze with permission. Giorgi Meladze is Director of the Center for Constitutional Research at Ilia State University in Tbilissi, Georgia. He is also Executive Director of the Liberty Institute. 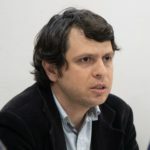 Mr. Meladze teaches at various universities in Georgia and provides grassroots training to human rights activists and campaigners internationally.